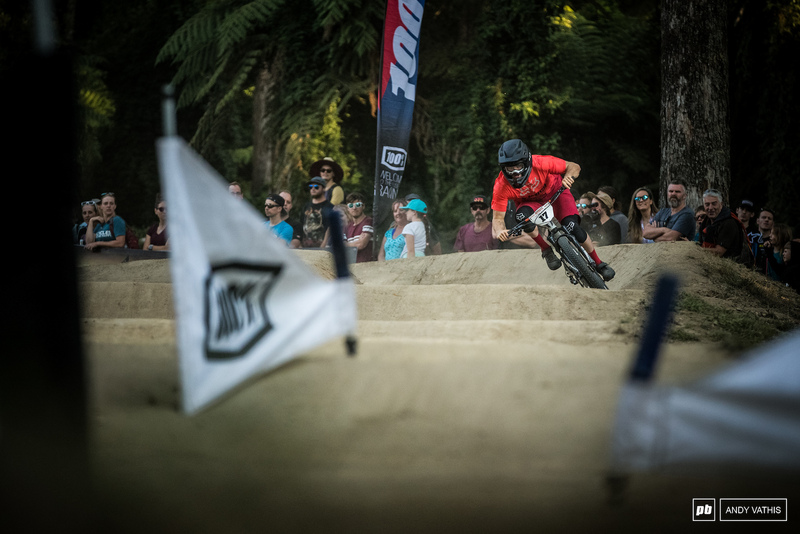 The 2019 racing season has officially kicked off with the double gate drop of the Crankworx Rotorua dual slalom. 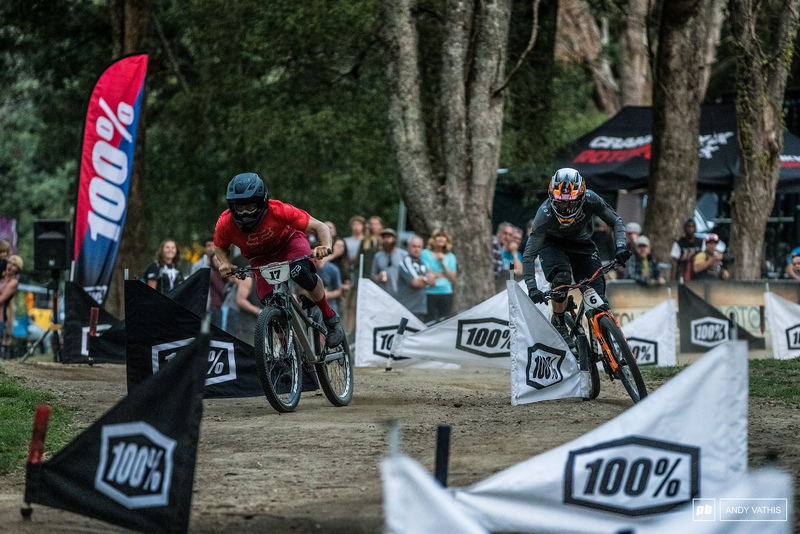 In the evening light, racers from all disciplines converged on the Wattles Tokorangi Forest venue for some head-to-head racing. With just 20 seconds of track to make it count, dual is a high pressure and high speed event, a single mistake can see you on the floor and out of the running. 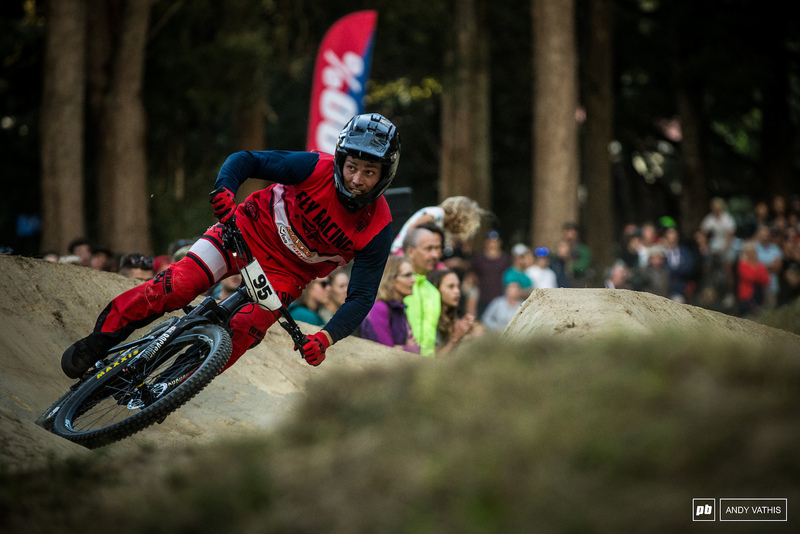 As you may have heard, dual slalom is now an official Crankworx World Tour event meaning we will see a Crankworx Dual Slalom World Champ at the end of the year in Whistler. 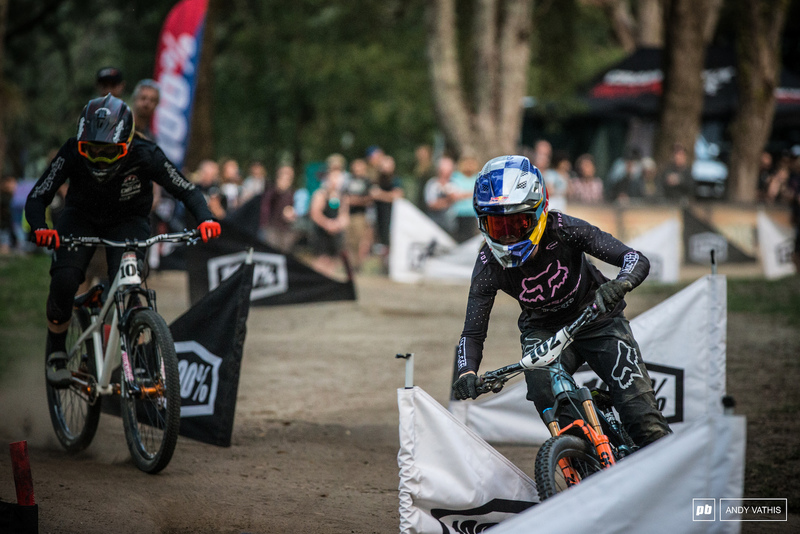 Previously, a highly talented field raced this action packed event with none other that Jill Kintner and Tomas Slavik winning their gates in 2018. 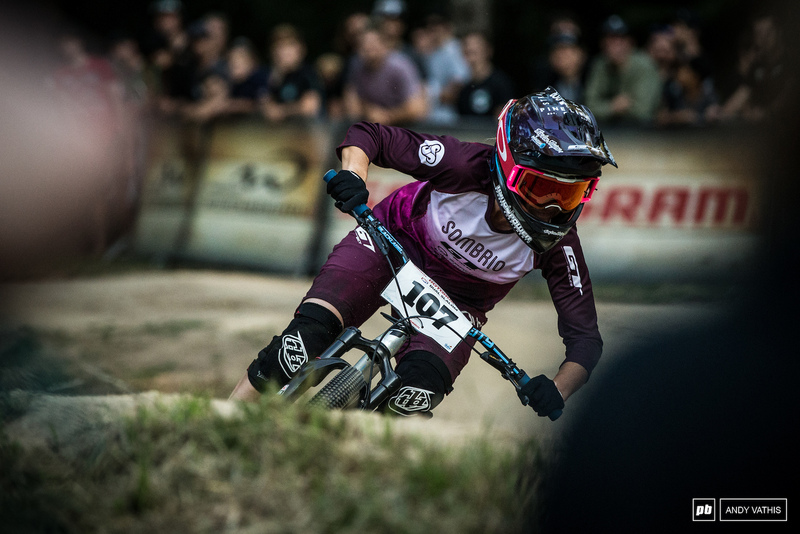 It’s safe to say for 2019, however, that we will see and different Pro Women's winner, and Queen of Crankworx all together, since Jill has officially pulled out of competing in CWXs, committing to her EWS goals. Fear not though as there is enough talent going around on the start list ready to fire all cylinders. The array of bikes chosen by the athletes has a 'race what you brought' attitude as well. 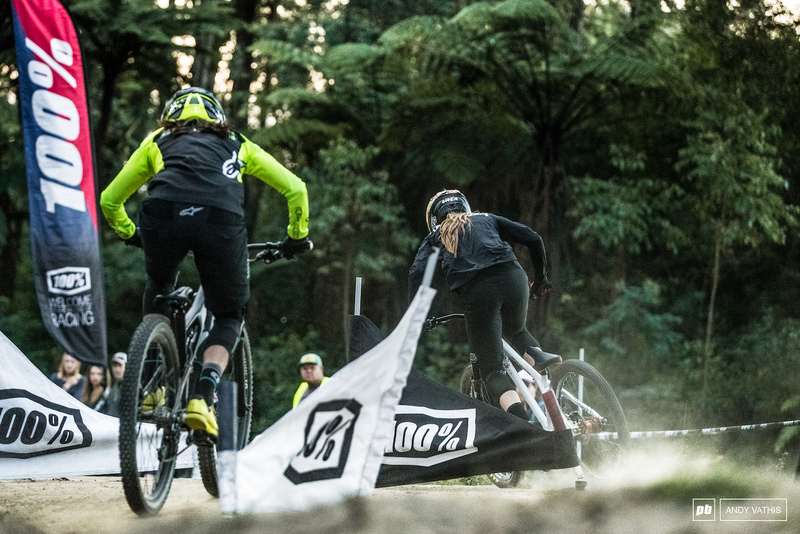 Tonight, there were a gang of trail bikes of both wheel sizes, 26in dirtjumpers and slope bikes, and you can't forget the Frankenstein 'trailslope' bikes. 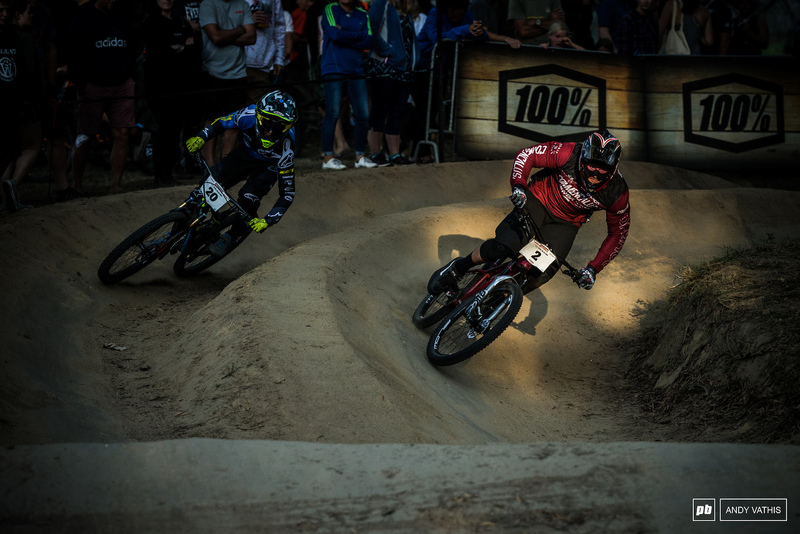 It truly is a healthy mix of BMX backgrounds up against downhill racers and even a few freeriders. 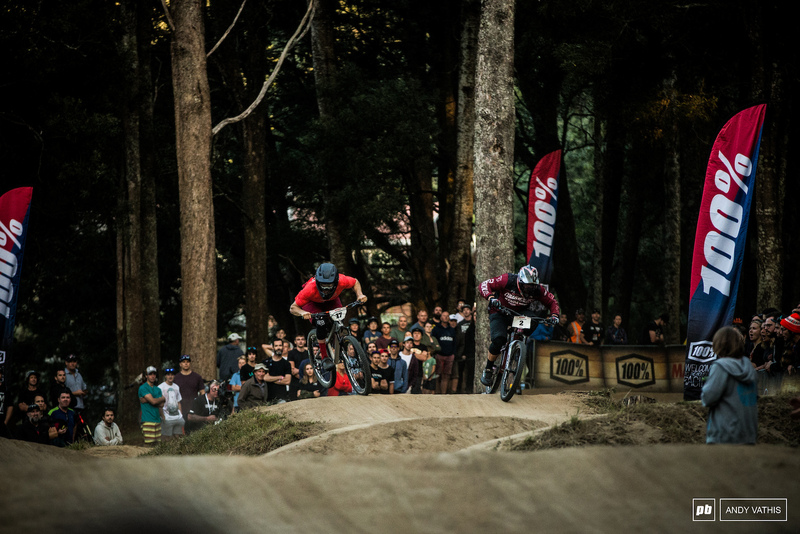 After a rapid-fire whittling, four riders remained in each category for the large and small finals. 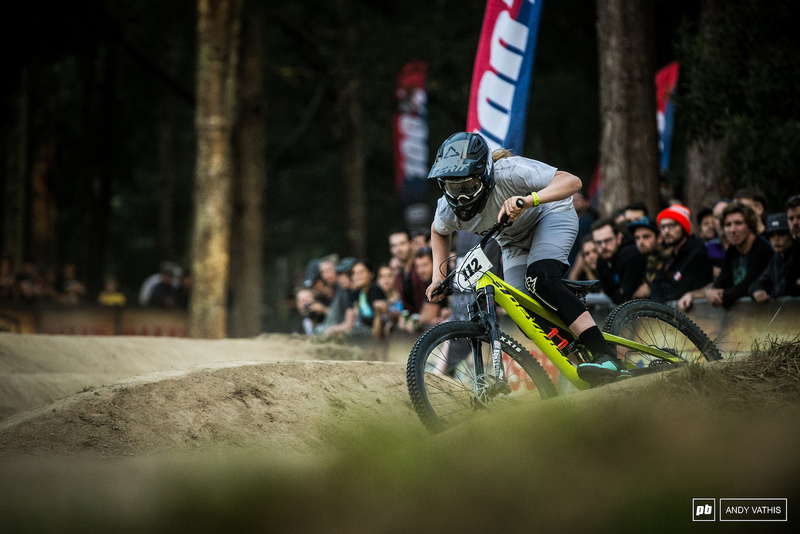 Women's fastest qualifier Tahnee Seagrave had slid out on the flat middle corners in her semi-final so she lined up and beat Kate Weatherly for bronze. 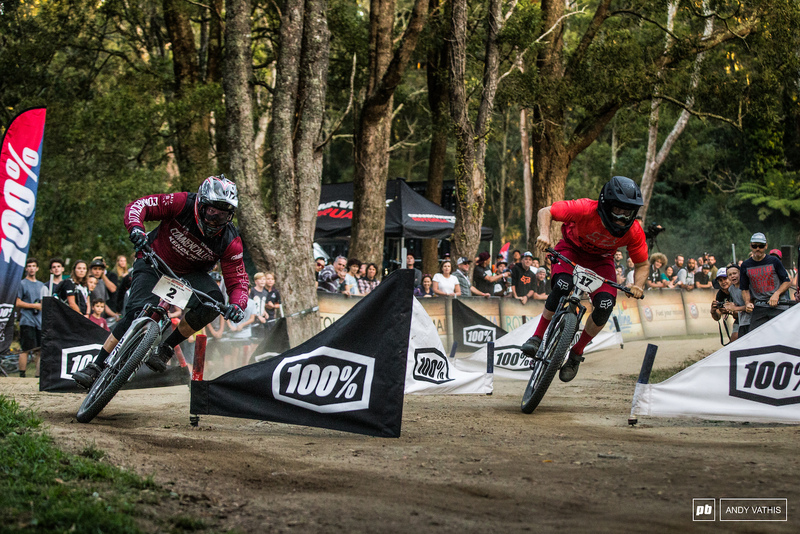 In the men's small final, BMX legend Barry Nobles faced off against Kyle Strait. Nobles lost the first round and ripped off his sleeves for the second but even that couldn't help him overcome the veteran of the discipline as Kyle added another medal to his collection. In the finals, Vaea Verbeeck entered a straight shoot out with Anneke Beerten. 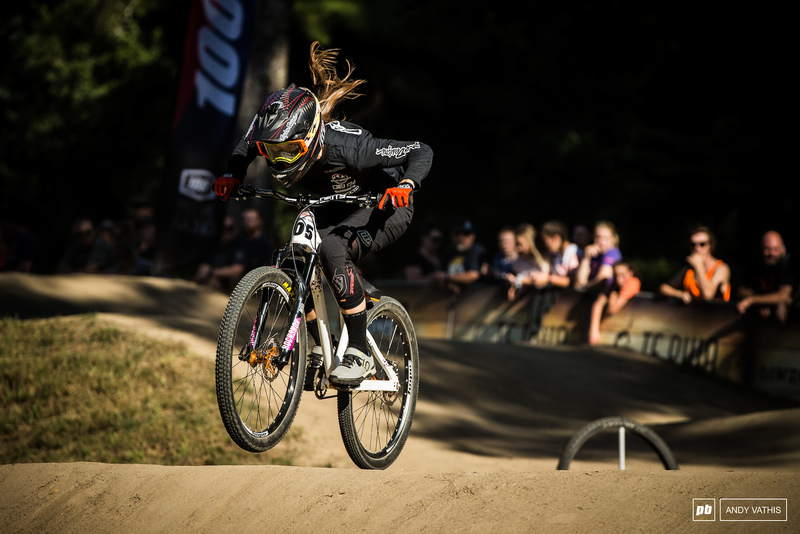 She won out both heats and has a second ever Crankworx win to add to her Redwoods downhill triumph from Rotorua last year. 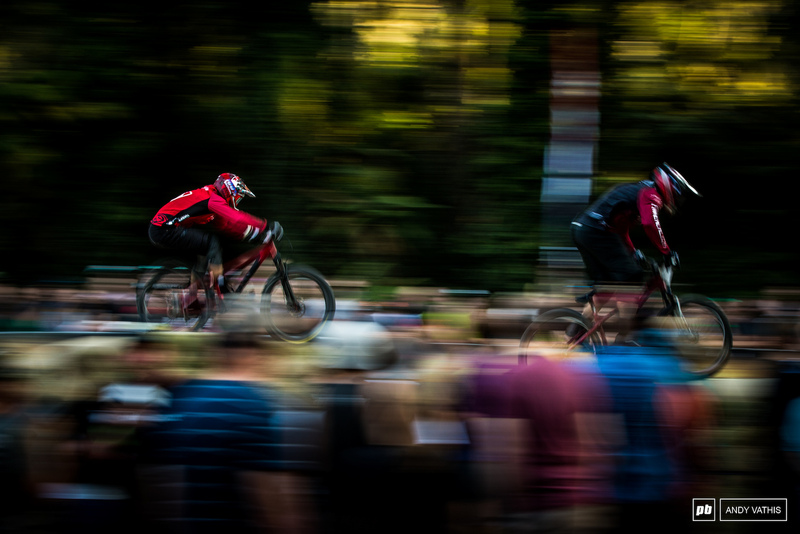 Keegan Wright and Bas Van Steenbergen battled it out in the men's competition. 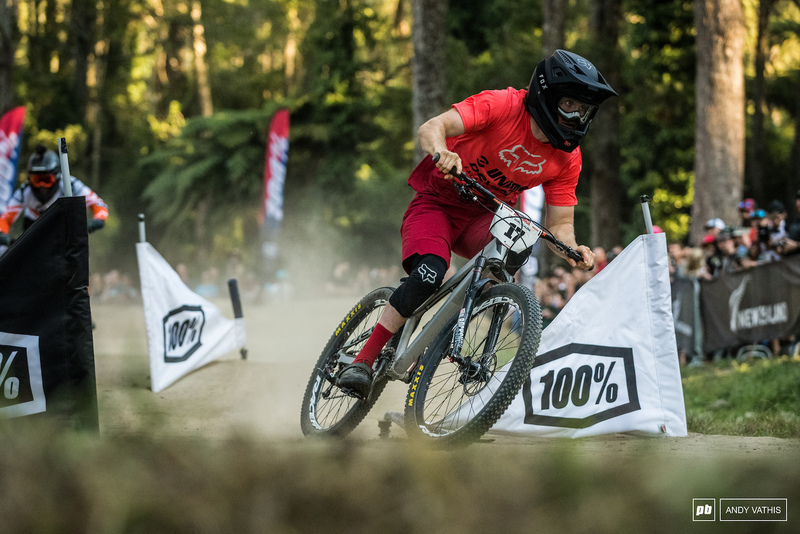 Bas won the first leg but Keegan pushed hard in the second and Bas lost the front wheel on the same flat turn as Seagrave, handing a very popular victory to the local. Martin Maes is out here trying master yet another discipline. Vaea Verbeeck was looking strong in practice. She was definitely marking herself out as one to watch. 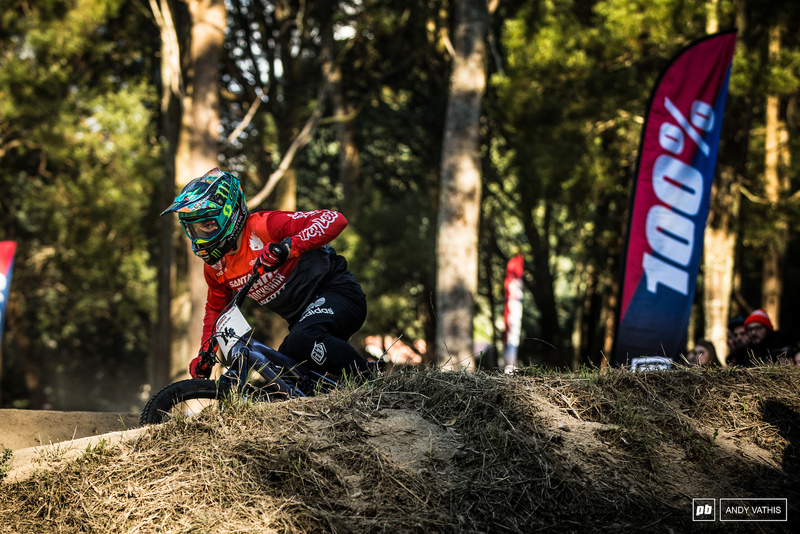 Bas van Steenbergen was making himself heard in the earlier rounds. He fought his way into the finals but not without a few close calls. 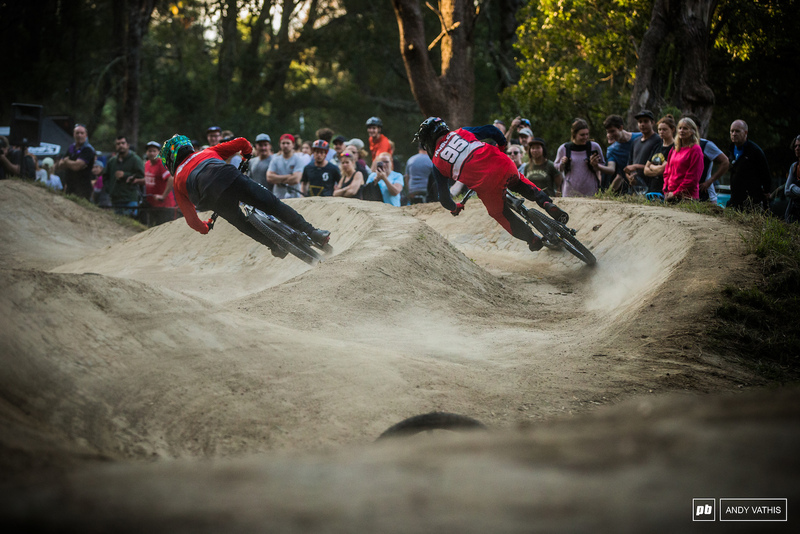 The beauty of dual slalom is that it attracts riders from different disciplines and backgrounds. Mitch Ropelato has been training hard and has high hopes for the upcoming World Cup season. He got knocked out early but not without a fight. Adrien Loron took Mikey Haderer out in the first round and kept climbing the ladder. Two heavy hitters in their own respects coming through. 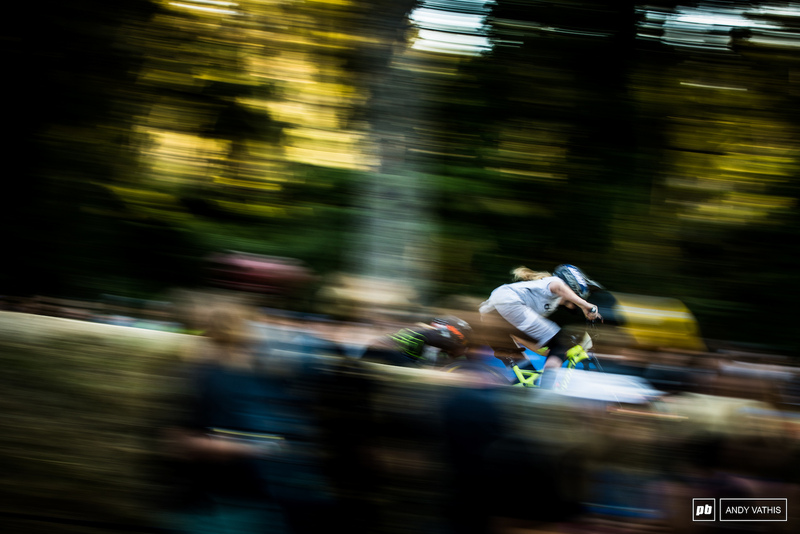 Local boy Keegan Wright came out the gate swinging to open up the Crankworx festivities. Rachel Strait stuck around into the top 10. The women were putting on a heater mixed with dramas and close racing. Kyle Strait qualified first and up until the finals rounds, it was easy to see why. Adrien Loron was hanging onto Kyle's wheel but never able to get past. Timing between the rollers was crucial. Barry Nobles taking a cheeky peek at the big screen for reassurance. Keegan and Kyle racing for an in to the finals. It was a real tight battle between these two. Keegan and Kyle tied in semis without a rerun. Next run down meant sudden death. 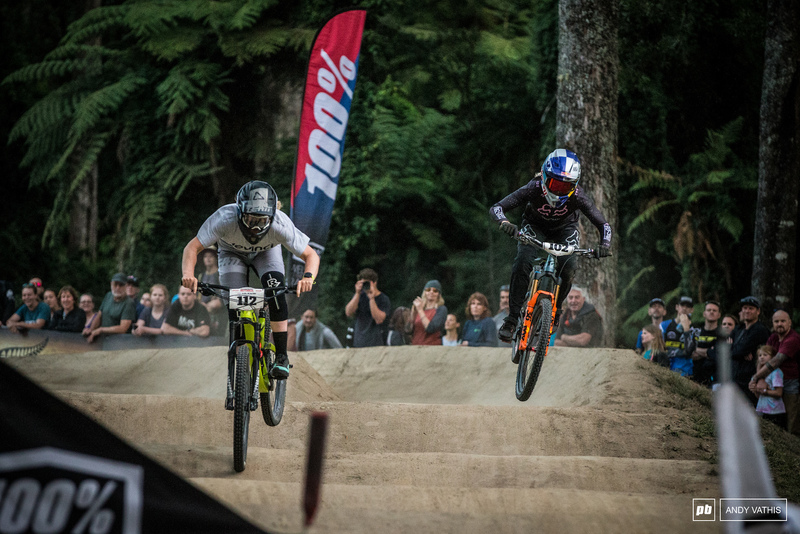 Tahnee Seagrave let it all hang out but the loose flat corners had other plans. Vaea looking back, making sure Tahnee was getting up from sliding out in the flat corners. This was her ticket into the final round. Tahnee was ahead of Vaea second time around but Vaea had the differential to move on ahead. Tahnee Seagrave finished in third. Kate Weatherly just missing out on the podium here at home. Tahnee settling in for bronze having comfortably won the first heat against Kate. Barry Nobles kept his sleeves on until end but just couldn't get the edge on Kyle Strait for bronze. 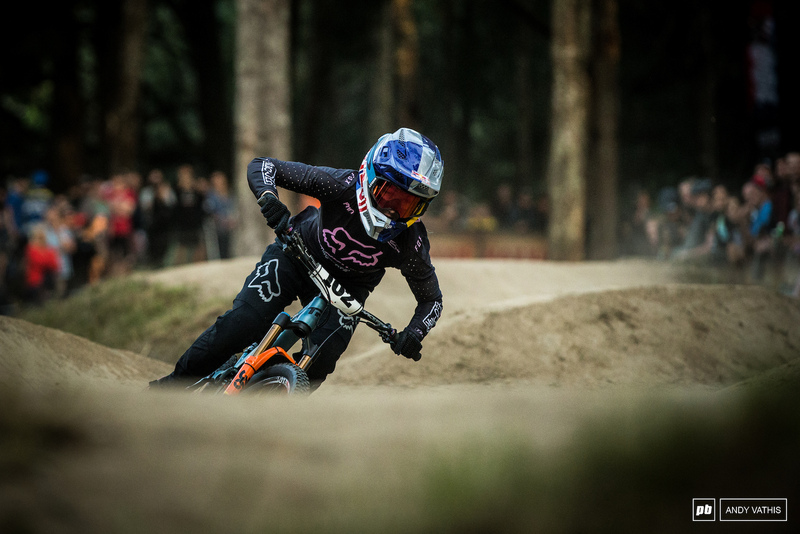 Anneke Beerten on full gas in the finals. Vaea Pullng away to victory. Vaea just edged it ahead of Anneke at the bottom of the track. Heat one of the men's final and it was anybody's game at the flat turns. 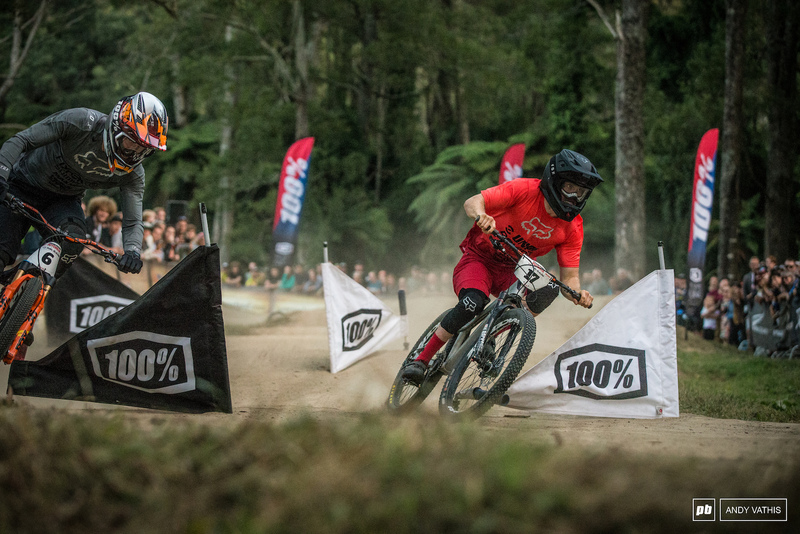 Keegan Wright full throttle for the home crowd and taking it for the Men's. He would have an easier time of it in the second run as Bas hit the deck. 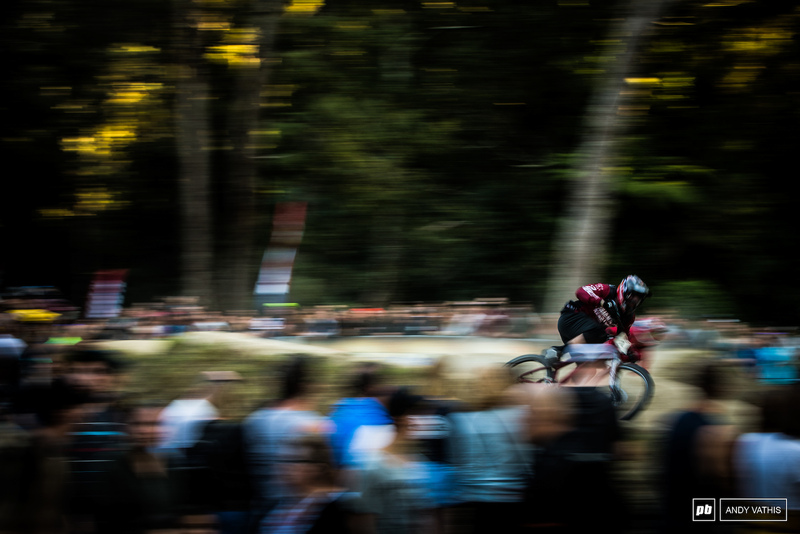 UCI/Redbull - you want TV friendly action? You want easy to see/film ALL the race? You want a fan favorite? Bring back slalom to the WC level!!!! I would say 4x!! Nothing Beats 4 people battling for the nº1 Spot!! @hardcoredivision: 4X has it's place. However, it often devolved into glorified BMX or who could take out who in a turn. Slalom is head to head, no courses cross each other. Both could be added in my book. @hardcoredivision: Red Bull does 4x, its called Crashed Ice now. Slalom course is much easier to arrange at lower cost and more accessible to amateurs than 4X. All you need is a grassfield on a slope. Like bottom of every single lift location. I am surprised why bike parks don't have it. 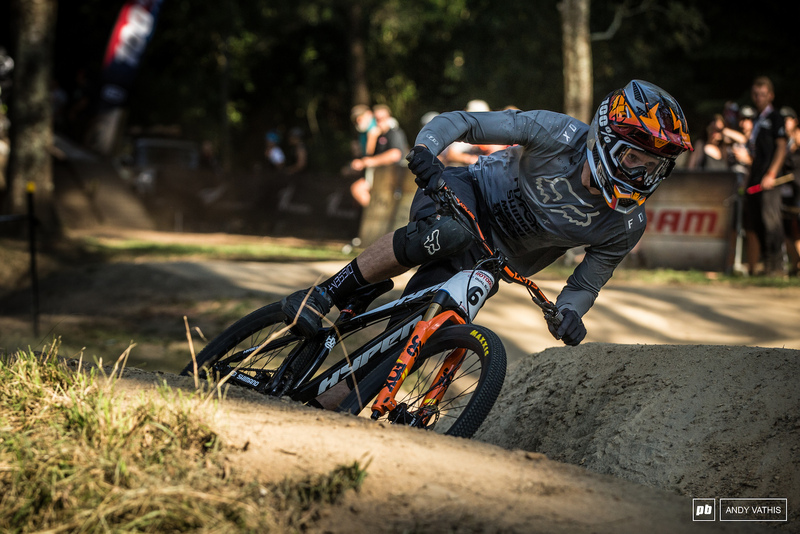 After pumptrack, slalom is the best tool to hone skills on a bike. And it costs virtually nothing. Now the 4X in it's current form is already not accessible enough and if it was to be transformed into what racers like Graves said it should look like, that is much bigger jumps, more rough sections, it would be out of reach of any non elite racer while track construction cost would be even higher. 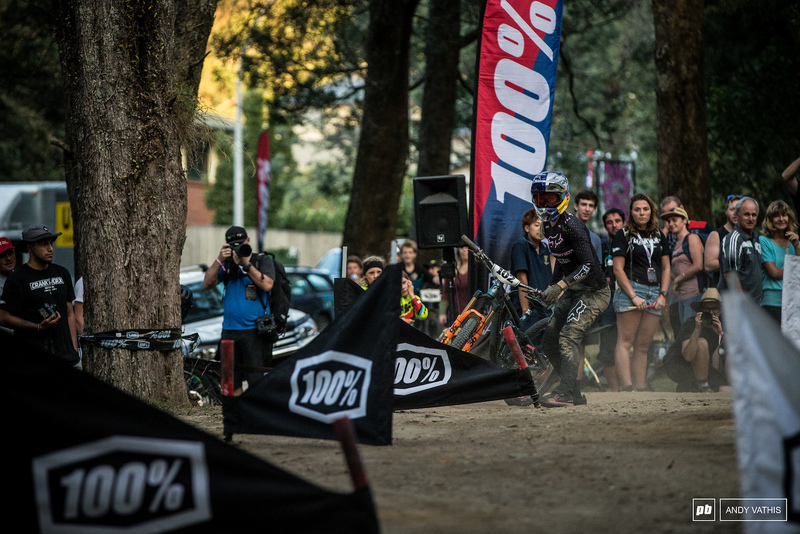 The truth is most 4X courses are a joke, BMXers send bigger things on kids bikes. Equal paychecks, bout' f'ing time sports world! Interesting setups, from hardtails with XC tires to mid travel bikes with DH-ish tires. Would love to hear how riders decide on what to ride. That's what I love about it. Bike racing in general is so varied with tech married to technique. F-ing love it! I've wondered this and asked around, too. 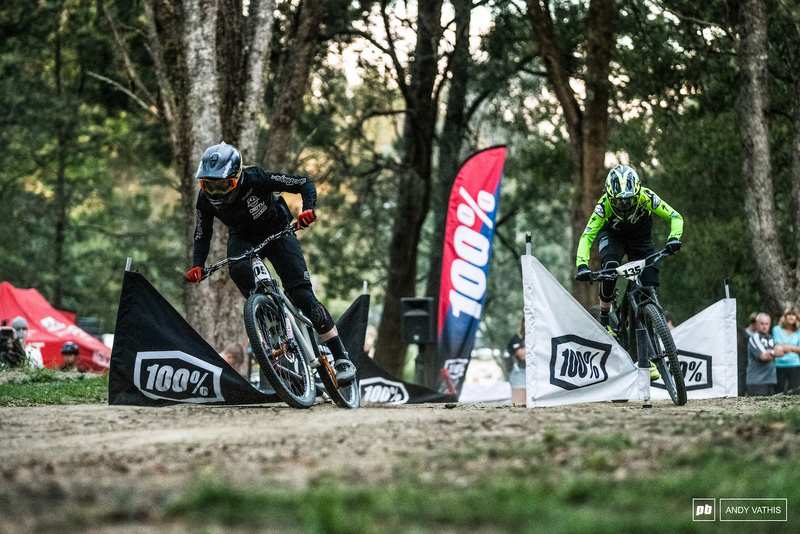 Most of the time, it's about what the rider feels most comfortable on; for the bmx guys even an XC IKON tire is the knobbiest crazy thing they'll ride. It's way more aggressive than what they are used to. 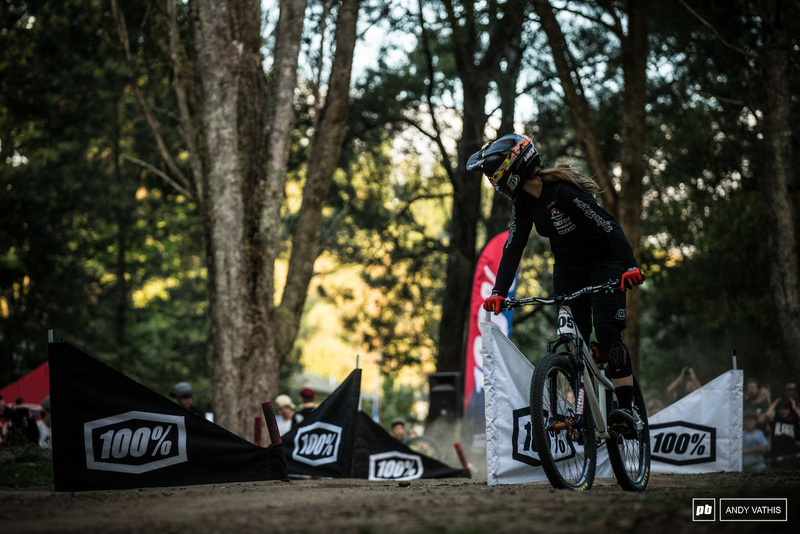 For the DH/trail riders who live on the moto-chunk of a DHF lets say, even though it's a heavy tire and perhaps overkill, they'll rock it because they know how far they can push the tire. I race a 100mm slope bike with low profile tires. 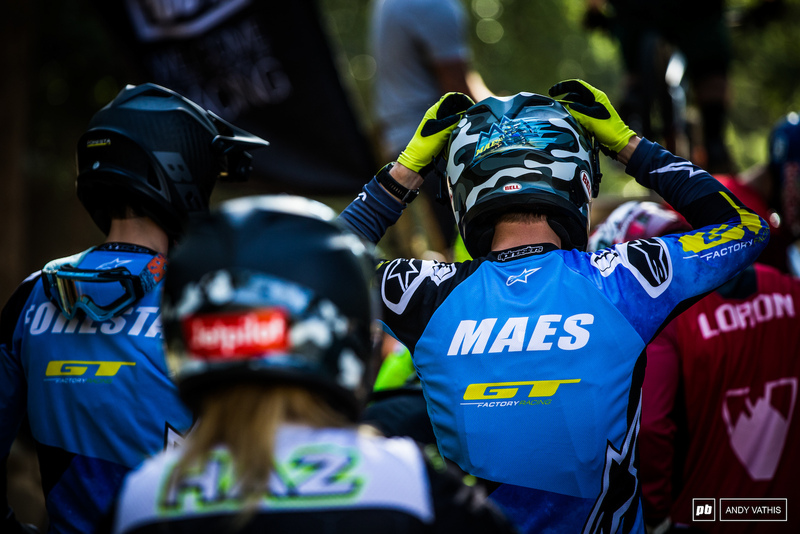 Pretty sure Martin Maes has already mastered dual slalom with wins at Sea Otter Dual Slalom 2 years in a row as well as multiple Crankworx Podiums in DS. ..did Kyle Strait forget his new RC shoes in Cali??? Dudes still rocking Vans!!! 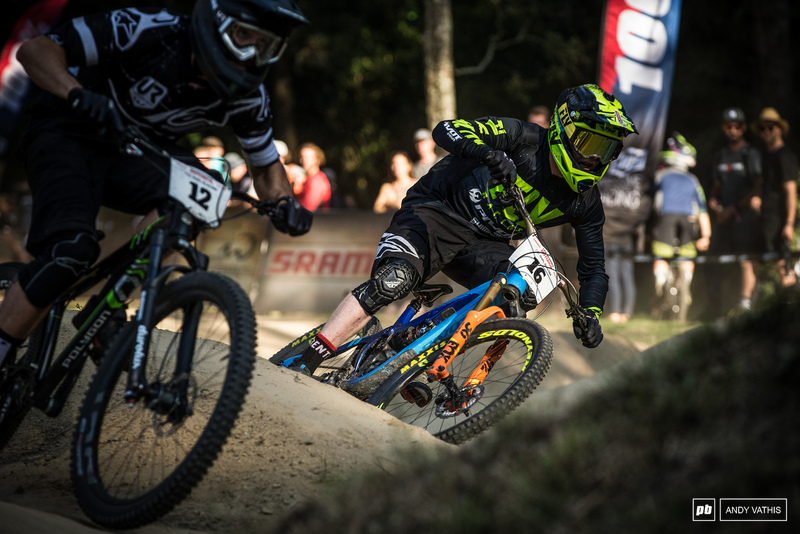 Mitch racing world cup this year? Dope! Savage Photo of Bas!!!! Congrats on the Win Keegan and Vaea!!! Cant wait for the rest of CrankWor. Thanks for all the coverage PB. 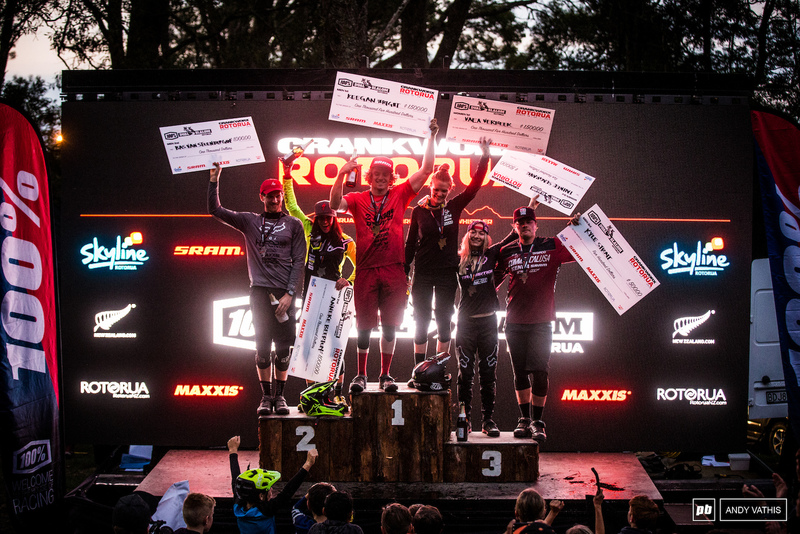 Question... why does DS not go into the Crankworx crown points system? Picked half my fantasy team around getting points on DS. Guess I shoulda paid more attention... though 5 of them got points. 3 of them were top 6 with 2 on the podium. Seems like you should be able to get points in every event that's pro or open. 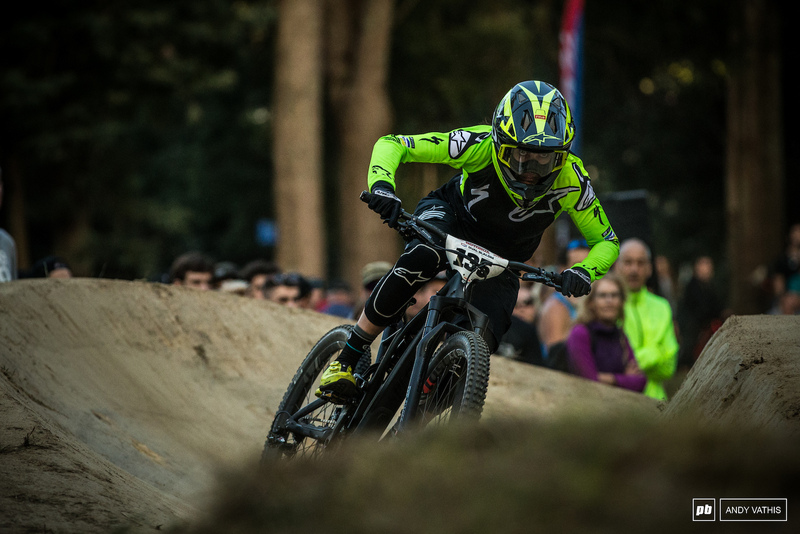 I personally think the new fox proto looks sick, really cool and sharp design. 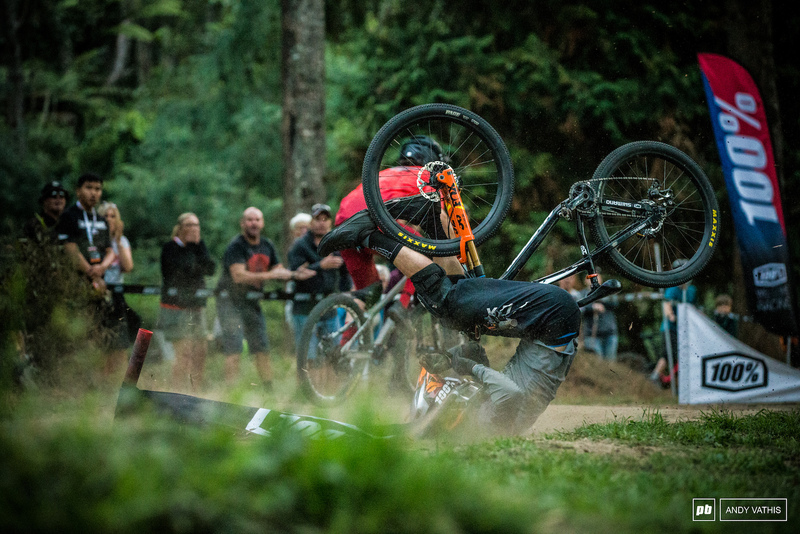 TLD on the other hand... let's just say the stage helmet will never be lucky enough to call my head its home... ever. @TannerValhouli: Stage still looks better than most of stuff coming up these days. That doesn't mean I would wear it. I had it in my hands and was afraid I will cut my fingers or they will get stuck in something. D3 stays the benchmark for me personally, followed shortly by Rampage Pro. the old fox rampage was absolutely spot-on, looking beefy but clean lines. the new one...looks a bit like a proframe... too many vents I'd say. D3 will just be for ever perfect, TLD Pls don't change it too much. That shot of Barry peaking at the screen mid turn is great!! 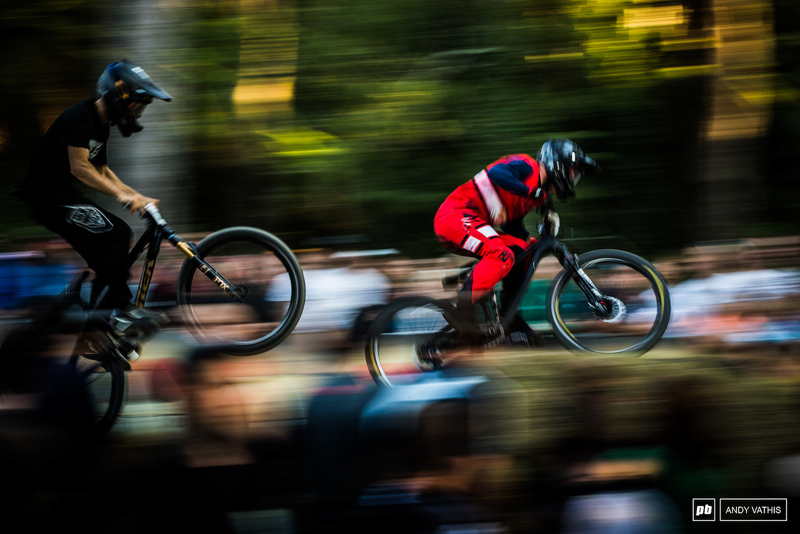 Taking his eyes off the line mid turn... Badass! 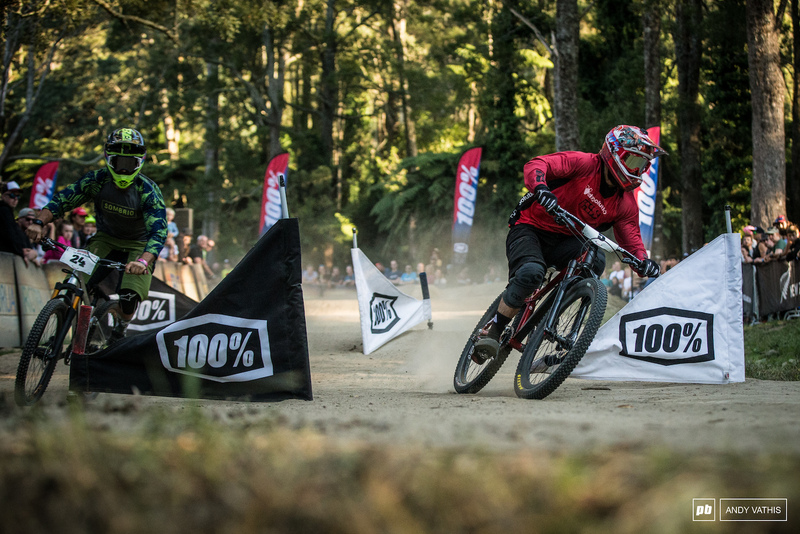 This course looks alot tamer than the whistler cwx from last cant wait for august and another shot at it!!! Oh and if you do leave out the photos of the new RS silver coloured forks. They look nearly as Walmart as the red ones!! The underwhelming prize money would not inspire anyone to turn pro in this sport. Whats up with Keegans right leg? "I was born with a disability called talipes. When I was born my foot was pretty much backwards and I had to have a series of operations to get it straight. I underwent about seven operations and for the first three years of my life I was in a cast. Since then I’ve been in a cast on that leg another two and a half years. My smaller leg actually has more power than my bigger leg, though so it doesn’t really give me any problems." Sick racing! Long live slalom!! On another note, whats up with the number plates? Make them look good or get rid of them. DS & 4x is some of the best racing action! This post has me so amped to go ride. The new Fox Rampage is looking sick!